Natural blondes spend time out in the summer sun and come in with enviable natural highlights. Add lemon or olive oil to your outdoor session and see even greater lightening results. Not everyone can, or wants, to devote that outdoor time to lightening, however. You can obviously lighten your hair at home using boxed highlighting kits, but for a natural, chemical-free take, simply reach into your kitchen cabinets for help. The results you get from natural lighteners depend on the color you're starting with -- don't expect to go from brunette to blond in one wash. You may need to several treatments to see a change. Chamomile is an ingredient in lightening shampoos for a reason: It works. This herb that's often brewed into a relaxing sleepy-time tea can also gradually change the hue of your hair. While sunlight accentuates the lightening effectiveness of chamomile, a regular rinse with a strongly brewed cup of tea will work even without the sun. After you shampoo and condition, rinse your hair with cooled tea. Don't rinse again with water. Style as usual. Use beer as a hair rinse to add brightness and bring out natural highlights. Use light beer, not a stout, and rinse your 'do with the libation after you've shampooed and conditioned. Follow a regular styling routine afterward. The beer will enliven your strands and bring out natural highlights, and it may even nourish your hair thanks to the presence of B vitamins and proteins. This sticky substance applied to your hair for eight to 12 hours can result in a lighter-colored head. Mix honey with distilled water in a spray bottle; use about 4 parts honey to every 1 part water. Add a little of your favorite conditioner to make the mixture more nourishing. Spritz your hair thoroughly with the blend, and cover your head with a shower cap for several hours -- overnight is ideal. Rinse the honey blend out with warm water and you're left with soft, honey-hued hair. Citrus juice helps lighten the color of your hair, so go for straight vitamin C to concentrate the effect. Crush a dozen or two vitamin C tablets into a paste and mix with a tablespoon or two of dandruff-reducing shampoo. Comb the paste through your hair; cover with a shower cap and allow it to sit for an hour or two. 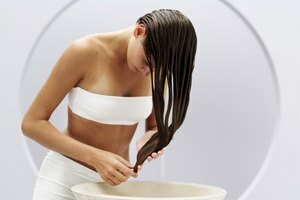 Rinse out the vitamin C and condition your hair; style as usual. Brunettes or redheads looking for highlights can opt for cinnamon. This spice may be reminiscent of oatmeal cookies and banana bread, but it naturally lightens darker tones without turning them brassy or orange. Simply wet your hair and comb conditioner through. Create a cinnamon paste with water and spread it through your strands. Leave it on several hours, or overnight for the most lightening effect. Although all of these natural lightening methods are safe, many can dry out your hair. Use any method just three to four times per week, and deep condition regularly.